10 questions with a total percentage and prompt scale to take data on questions. 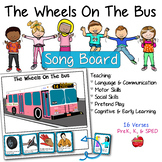 A great activity to do with students who love the "Wheels On The Bus Song" and learn using visuals. 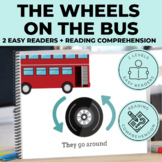 Use these pictures to make the book interactive for your students. 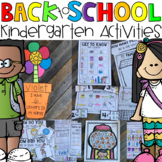 I laminated and used velcro when using these pictures. 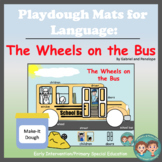 The book has come alive in my special education preschool. 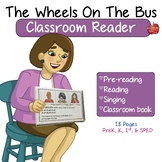 Adapted book used to help students begin to read in my special needs preschool classroom. 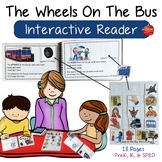 My students are reading the book with the pictures. 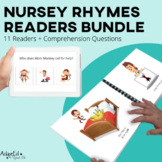 This ActivInspire flipchart book provides the perfect visual aids for this favorite sing-along song. 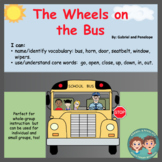 The core words (open/close, up/down, in/out) and fringe words (parts of a bus) increase understanding for your students with autism and developmental delays. 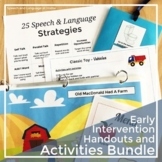 This flipchart lesson includes:•	"I can"
Students will identify the connections between animals that live on a farm and what products they produce by singing this fun song. 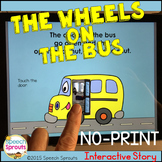 (tune to Wheels on the Bus) The visuals will help students learn what products we receive from farm animals.